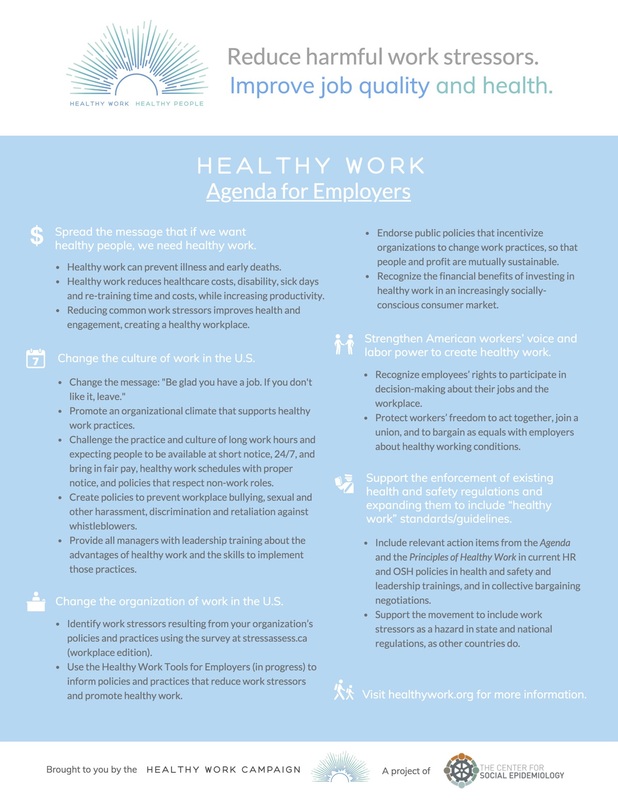 Created to support the Healthy Work Campaign, the Agenda is a set of actions that can support and promote “healthy work.” Those actions are part of an effort to encourage “thinking big” about what’s needed to create healthy work in the U.S. The Agenda can start a conversation or support existing discussions or activities. Print the Agenda to share with members of your organization who you believe would be interested and able to make decisions about taking actions suggested in the Agenda. Please let us know how you’ve used it, and what happened. Thanks! For specific tools and resources to address work stressors in your organization, implement policies and practices, see the latest “intervention” research, or to find what other organizations and groups have done about unhealthy work, see Healthy Work Tools – For Employers. Spread the message that if we want healthy people, we need healthy work. Promote an organizational climate that supports healthy work practices. Challenge the practice and culture of long work hours and expecting people to be available at short notice, 24/7, and bring in fair pay, healthy work schedules with proper notice, and policies that respect non-work roles. Create policies to prevent workplace bullying, sexual and other harassment, discrimination and retaliation against whistleblowers. Provide all managers with leadership training about the advantages of healthy work and the skills to implement those practices. Identify work stressors resulting from your organization’s policies and practices using this online survey. Use the Healthy Work Tools for Employers (in progress) to inform policies and practices that reduce work stressors and promote healthy work. Endorse public policies that incentivize organizations to change work practices, so that people and profit are mutually sustainable. Recognize the financial benefits of investing in healthy work in an increasingly socially-conscious consumer market. Strengthen American workers’ voice & labor power to create healthy work. Recognize employees’ rights to participate in decision-making about their jobs and the workplace. Protect workers’ freedom to act together, join a union, and to bargain as equals with employers about healthy working conditions. Support the enforcement of existing health and safety regulations and expanding them to include “healthy work” standards/guidelines. Include relevant action items from the Agenda and the Principles of Healthy Work in current HR and OSH policies in health and safety and leadership trainings, and in collective bargaining negotiations.